Our mission at Covenant Home Care is to ensure a better quality of life for seniors, disabled citizens and their families, by providing dependable and affordable in-home care. Our caring service makes it possible for the elderly to maintain as much independence as possible, by providing the appropriate in home assistance and companionship. In that way we lift spirits not only of the elderly, but of the family caregivers as well. 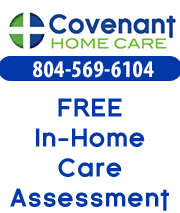 Covenant Home Care serves adults in Richmond and all surrounding counties.